Post-Doc Hélder Fraga selected in FCT "Individual Call to Scientific Employment Stimulus"
Post-doc researcher Hélder Fraga was selected in the highly competitive FCT "Individual Call to Scientific Employment Stimulus" to become a Junior Researcher contracted by UTAD/CITAB, with FCT funding. This achievement was most remarkable within UTAD, being the only candidate selected. 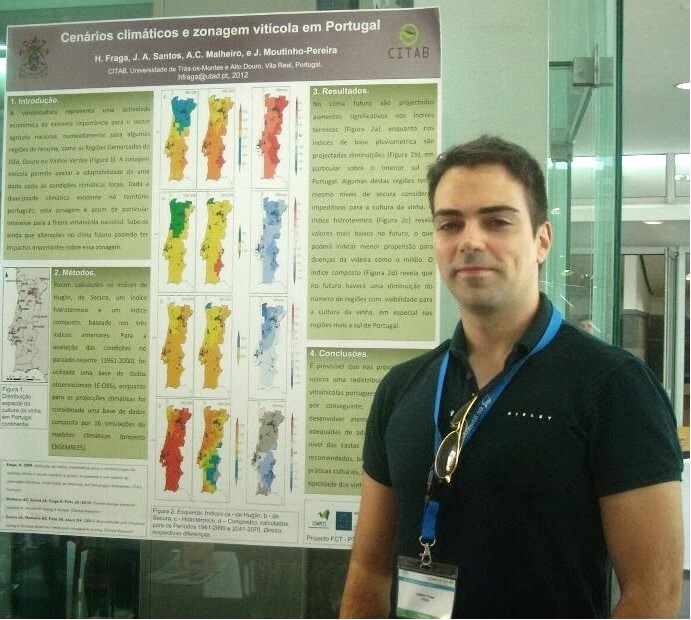 Hélder Fraga has a PhD in Agronomic Sciences and Forestry (specialization in agro-meteorology), from the University of Trás-os-Montes e Alto Douro (UTAD). In his research career, he has been focusing on the impacts of climate change on crops, and more specifically on grapevines. For this purpose, he has been developing various crop/atmospheric modelling approaches. He completed his PhD in 20-03-2014, which was unanimously classified as “Outstanding” by an international jury. His work on viticulture vs. climate change received a vast international recognition, and some of his scientific publications were even cited in the latest IPCC report in 2015. One of his works was published in the high ranking journal Global Change Biology (IF>8). Due to these publications, he was invited to participate at several international events, such as the ClimWine conference in 2016 in France (invited speaker), and the Ampelos symposium in Greece in 2017 (scientific committee). This line of research also allowed him to establish strategic partnerships with several researchers in top R&D institutions, such as the Institut National de la Recherche Agronomique, the Karlsruhe Institute of Technology, the Southern Oregon University and the Universidad Politécnica de Madrid. In his relatively short research career, he participated in 12 R&D and cooperation projects, published 26 articles in JCR-indexed journals (h-index: 12), 1 book chapter and over 70 publications/proceedings in scientific meetings.